Gene Leroy Wiggins, Gunner's Mate 3/c, born July 25, 1925, Ventura, CA. 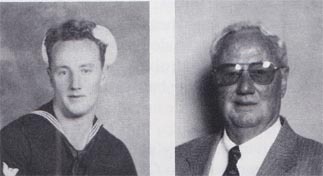 He joined the USNR April 28, 1943, as a gunner's mate. He was stationed at NTS Farragut, ID, for 12 weeks; Sand Point NAS; and aboard the USS West Virginia. Memorable experiences include USNRS Treasure Island (ship's company). Discharged March 4, 1946, as GM3/c. Awards include the Asiatic-Pacific w/4 stars, American Area, WWII Victory Medal and the Philippine Liberation w/2 stars. He was a partner in San Joaquin Dental and worked as a dental technician for 43 years. Married Lurline Storm Aug. 30, 1947, and has two children and four grandchildren. He retired in December 1988.